Cambrian Models have been trading since January 1973. We began by making 3-link and Screw-type couplings in 4mm scale. This began after a chance meeting with Ted Morris at Kings Cross Model Shop, when trying to purchase parts for a kit-building service. Later couplings were also made in 7mm scale. 4mm scale loco brake standards were also produced in brass. 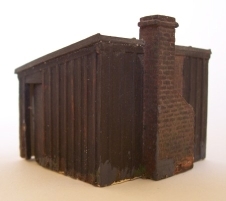 The first plastic kit was for a sleeper-built platelayer’s hut. The prototype was near Derry Ormond Station on the Aberaeron branch in mid-Wales. It is seen in the distance in a picture in the Middleton Press "Aberystwyth to Carmarthen" book. If you find one of these kits, it will have raised "dotted" numbers on the inside that were used in the instructions. The earliest ones were moulded in white plastic and have the door and window as part of the walls, rather than as a separate moulding. On later ones the door & window was a separate moulding. The first wagon kits were RCH 5, 7 and 8 plank types. The underframe for these included the longitudinals & cross members. There were also 3 and 4 plank wagons later and a "beer" van. The 3 plank was later available lettered for "Lancashire Steel Corporation". The earliest kits, which are sometimes offered for sale, have black printing on "gold" paper labels and have an image of "Puffing Billy" (Mrs. Cambrian is said to be a descendent of William Hedley). Slightly later labels are similar, but have purple printing. Then, for quite a few years, labels had a "wagon" style design, with a rounded rectangle and two "wheels" below, in "Process Blue". Lettered kits said "Lettered Wagon Kit" and others had a white label for the type with "Wagon Kit" below. The early body moulds had detail produced partly by DIY 2-stage etching using a Kodak process that was less than perfect! The C31 Container kit still has parts of the mould that were etched. The oldest kits that are still available, but with newer tooling, are the GWR 10ton Ballast and Loco Coal wagons, plus the LMS & LNER 16ton minerals. For many years, our range included pre-lettered Private Owner wagons. These were lettered using dry transfers printed by us. Also we do not make kits of prototypes that fly. We are not and never have been connected in any way with the "Cambrian Model Company" (aka "Cambrian Direct").